As we set our hearts on another year, the The Coffee Bean & Tea Leaf®’s hopeful mission is this: to enable its community to expand​ ​their​ ​vision​ ​by​ ​including​ ​others. “The question for everyone alive today is this: What kind of legacy will you behind? Will you leave a beautiful legacy for others to enjoy? Or will you leave a legacy of debt, pain, poverty, and sin that the people who come after you will have to pay for? As a socially-responsible company, the legacy The Coffee Bean & Tea Leaf® hopes to leave behind is one that transforms lives and communities for the better. With a vision of multiplying its impact for its fellow Filipinos, it calls upon its own network of Team Members and Customers to do the same. 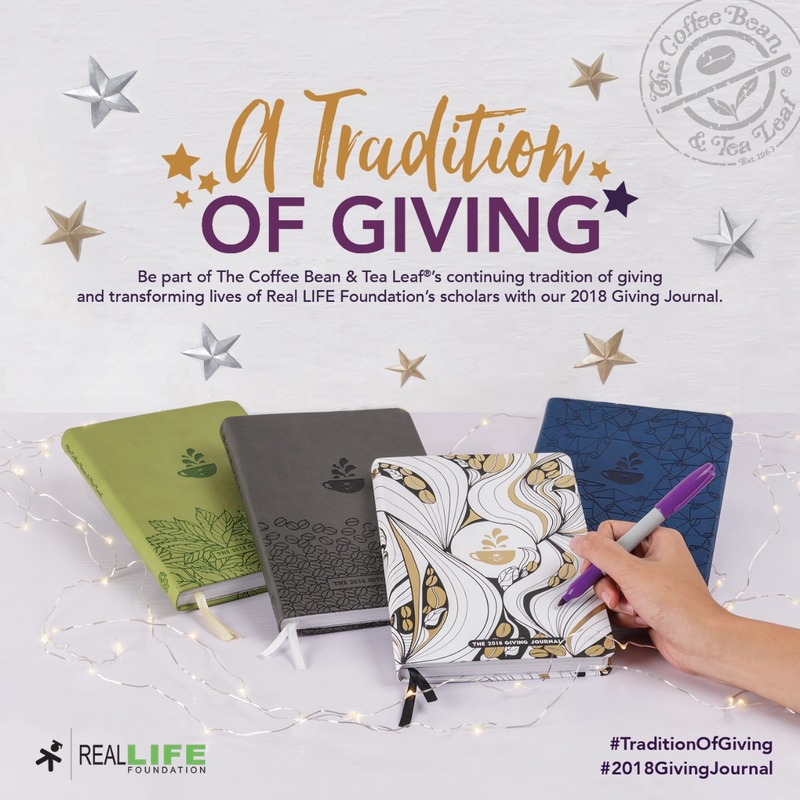 Every year, those who partake in the holiday tradition of The Coffee Bean & Tea Leaf® by supporting their Giving Journal initiative is able to help live out the legacy of the Real LIFE Foundation, the direct beneficiary​ ​of​ ​the​ ​Giving​ ​Journal. The Real LIFE Foundation exists to serve the poor in the Philippines by providing opportunities for educational assistance and holistic development. Since established, Real LIFE has not only allowed over 300 scholars from all over the country to earn a university degree, it has more importantly empowered these scholars to meaningfully impact the lives of others as productive change agents for good, much in the as way their own lives have been changed. Through the tremendous support we receive each year for our Giving Journal campaign, we have been able to directly support the Real LIFE Foundation, producing over 40 graduates- a number we commit to growing through the years as The​ ​Coffee​ ​Bean​ ​& ​Tea​ ​Leaf®​ ​sustains​ ​its​ ​efforts​ ​in​ ​nation​ ​building. As we commence the holiday traditions and look forward to a new year ahead with the Giving Journal, it is ​The Coffee Bean & Tea Leaf®’s hope that we will all be filled with the spirit of humility, compassion, and generosity, and that we all learn to set aside our self-centered agendas and consider the needs of others as we strive to be persons of value within our own communities and our country. To make its 10th year even more special, the 2018 lineup of Giving Journals from The Coffee Bean & Tea Leaf® comes with a customizable cover specially made for individuals who use art as a form of creative self-expression. Three other Giving Journals are available in colors of green, grey, and blue, with designs that reflect The Coffee Bean & Tea Leaf®​’s premium coffees and teas. 1. The 2018 Giving Journal may be claimed at any The Coffee Bean & Tea Leaf® store all through the promo period from October 21, 2017 to January 14, 2018 or until 60 days afterthe​ ​promo​ ​has​ ​ended. 4. The stamp card must always be presented UPON PURCHASE so that a circle may be stamped​ ​whenever​ ​its​ ​corresponding​ ​product​ ​assignment​ ​is​ ​purchased. 5. The completed stamp card should be presented and surrendered to the branch where The Giving Journal will be claimed. The cashier will punch the stamp card to prevent reuse. Combining​ ​of​ ​stamps​ ​cards​ ​is​ ​not​ ​allowed.